Nigeria has confirmed the permanent appointment of caretaker coach Salisu Yusuf to the senior national team but have been forced into an embarrassing backtrack over their announcement of Frenchman Paul le Guen as technical advisor. The Nigeria Football Federation (NFF) officially handed the position of head coach to Yusuf at their executive committee meeting on Wednesday, the organisation confirmed in a statement. They have also asked their technical and development committee to come up with a recommendation for the post of technical advisor within seven days. The NFF announced that former Paris St Germain and Rangers manager Le Guen would fill the role on Monday, subject to agreeing personal terms, but were left red-faced when the 52-year-old told French media the following day he had no intention of accepting their offer. The NFF later released a statement in which they denied approving Le Guen for the role, saying his name had been put forward as a mere recommendation by the technical and development committee. "The technical and development committee perused the profiles of all the coaches who submitted applications and find Mr. Paul Le Guen suitable for the post," a statement said. "But during final negotiations, he objected to being given a target and also did not wish to live in Nigeria, which was a sore point with the board." Yusuf had been in charge of the national team for Nigeria's two friendly matches played in May, a 1-0 victory over Mali and a 3-1 success against Luxembourg. The country has been searching for a permanent head coach since the resignation in February of former national team star Sunday Oliseh, who cited contract breaches and unpaid salaries for is decision to quit. Nigeria's next fixture is a dead-rubber African Nations Cup qualifier against Tanzania in September with both nations out of the running for the finals. The country has also been drawn alongside Algeria, Zambia and Cameroon in the qualifiers for the World Cup in Russia that start in October. 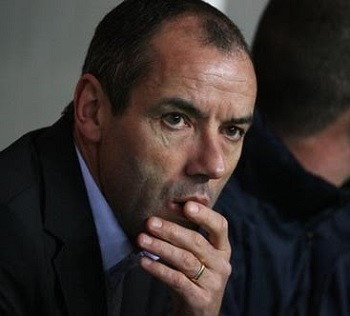 Facts have emerged why Frenchman, Paul Le Guen rejected the offer to coach the Nigerian national football team, the Super Eagles. Chairman of the NFF Media and Publicity Committee, Hon. Suleiman Yahaya-Kwande, who revealed this, dismissed reports in local and international media of the Frenchman’s rejection of the position. He said the NFF's Technical and Development Committee only recommended that Frenchman Paul Le Guen be named the new Technical Adviser of the Super Eagles, saying all sub –committees in the Federation can only make recommendations to the Board. “The press statement was clear, to the effect that all appointments made at the Technical and Development Committee meeting were mere recommendations, which had to be deliberated upon and agreed to by the Board. No sub –committee in the NFF, except the judicial bodies, takes decisions. They only make recommendations. The Technical and Development Committee of the NFF had on Monday named Le Guen as the new Super Eagles head coach. However, top French journalist, Herve Penot, revealed on his verified Twitter handle, @hpenot_lequipe, in French that the tactician will not go to Nigeria since his conditions were not met by the NFF. 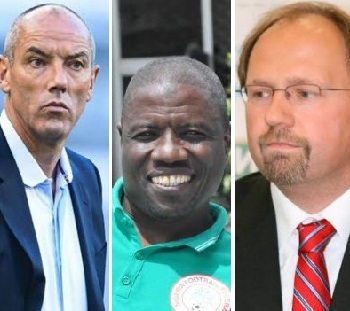 After so much application for the top job, the Technical and Development Committee of the NFF on Monday named Le Guen as the new gaffer from a three-man-shortlist, which included Belgian tactician, Tom Saintfiet, and Nigeria’s Salisu Yusuf. Recall that former coach of the Super Eagles, Sunday Oliseh, resigned his position, citing a breach of contract by Nigeria’s football body. The former captain announced his resignation, citing unpaid salaries, lack of cooperation, among other factors as responsible for his action. With the new development, Nigeria’s chances of qualifying for the 2018 Fifa World Cup in Russia may be at danger. Paul Le Guen has been named the new Super Eagles Coach of Nigeria by the Nigeria Football Federation (NFF). The Frenchman was picked from a three-man shortlist that included Salisu Yusuf and Tom Saintfiet. It is also understood that the NFF will consider Yusuf as an assistant coach. The former Kano Pillars boss had earlier said he was not interested in being second in command to anybody. The official said: “As it is now the position of the deputy has been thrown open because Yusuf is still insisting that he would not work as an assistant to Le Guen. Tags: Latest News Local News NFF Paul Le Guen Salisu Yusuf Slider Sports Tom Saintfiet. The Nigeria Football Federation has put former Ethiopian coach Tom Sainfiet, Super Eagles’ caretaker coach Salisu Yusuf and Frenchman Paul Le Guen, who once coached Cameroon, on a shortlist of candidates for the position of Super Eagles’ Head Coach, a statement issued today reads. On Friday at the Glass House, the NFF Technical and Development Committee pored over more than 20 applications before cutting the list to three. Among those who showed interest in coaching the three –time African champions are Giovanni Solinas, Saintfiet, Hey Antoine, Mark Wotte, Yusuf, Ernesto Paulo Calvinho, Dorian Marin, Le Guen, Miodrag Jesic, Perry Hansen, Ove Pedersen, Adebayo Lateef Kola, Sylvanus Okpala, Peter Ijeh, Vladimir Petrovic-Pizon, Lodewijk de Kruif, Kenichi Yatsuhashi, Bjorn Frank Peters and Ricki Herbert. Belgian Saintfiet, 43, coached the National Teams of Namibia, Zimbabwe, Ethiopia, Yemen, Malawi and Togo, and also worked with the Qatar U-17 side, Young Africans FC of Tanzania and Free State Stars FC in South Africa. Yusuf, 54, was capped by Nigeria at U20 level, won FA Cup titles with El-Kanemi Warriors of Maiduguri as a player and coached top clubs Kano Pillars, El-Kanemi Warriors and Enyimba FC. He assisted Super Eagles’ chiefs Samson Siasia and Stephen Keshi (of blessed memory), and was caretaker coach for two friendlies that the Eagles won against Mali and Luxembourg in Europe at the end of May. Le Guen, 52, played for Brest, Nantes and Paris Saint Germain and won 17 caps for France, before coaching Rennes, Lyon, PSG (in France) and Glasgow Rangers (in Scotland). He qualified the Indomitable Lions of Cameroon for the 2010 FIFA World Cup finals and also coached Oman. Chairman of the Technical and Development Committee, Chris Green, told NFF. "We set a criteria with which we evaluated the nearly two dozen applications and then agreed on the three persons that we shortlisted. The Committee will meet on Monday, 18th July 2016 to interview the shortlisted candidates and immediately name the next Super Eagles’ Head Coach"